Dooley, a 4-year-old Shetland Sheepdog, managed to survive not only a tragic car crash, but a whopping 53 days on his own in the Nevada wilderness. 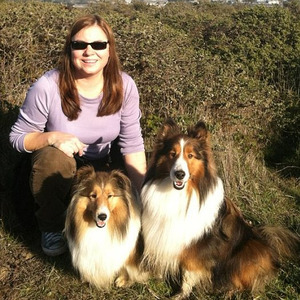 Barbara Bagley, her husband, Brad Vom Baur, and their two Shetland Sheepdogs were traveling in their car along a stretch of Interstate 80 near Battle Mountain, Nevada, on December 27th when an accident would change their family forever. Bagley and her husband were rushed from the scene with severe injuries. One dog, Delany, was killed in the accident; the other, Dooley, had vanished. Sadly, Vom Baur died of his injuries on January 6th. Heartbroken, Bagley set her sights on bringing Dooley home. “Something inside me told me Dooley was still alive out there,” Bagley told the press. Bagley’s instincts were right: Dooley fled from the scene of the crash and was out there somewhere. People reported sightings of a “Lassie-type dog” near the crash site, giving Bagley hope that she would see Dooley again. Thanks to Facebook, word of Bagley’s search spread. Volunteers combed the Nevada wilderness for any sign of the Sheltie. The search continued through February 18th, when finally, a mere five miles from the crash site, a skittish Dooley was apprehended. Accounts suggest that Dooley lived of off of roadkill scraps and limited water sources. Though he lost over half of his body weight, Dooley is now on the mend – and so is Barbara Bagley. Bagley is still grieving, but she is thankful to have Dooley by her side, safe and sound at last.